Students conduct an experiment simulating how chemists determine toxicity while Paul Rogers, Stephen F. Austin State University junior computer science major from Wells, assists. 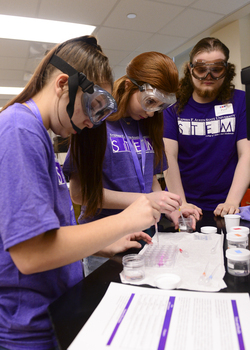 NACOGDOCHES, Texas - More than four hundred high school students attended Stephen F. Austin State University's seventh annual STEM Day Friday, exploring different areas of STEM through interactive faculty-led sessions, two STEM student panels and a physics magic show. Students chose between twenty-three different sessions covering a wide variety of subjects, including chemistry, computer science, engineering, mathematics, forestry and health science. "This event not only exposes students to hands-on activities that spark an interest and an awareness in STEM education, but this year we're also looking at recruitment," said Dr. Jana Redfield, assistant director of the STEM Research and Learning and Center. "We want these students at SFA, and we know that if they can see themselves here in classrooms and labs, working with faculty and interacting with STEM majors, they may be more likely to consider SFA for their future."